I went into The Longest 5 Minutes not knowing a lot about the game. I’d seen trailers and had a general idea of what the game was about but i wasn’t anticipating much from it. It was a nice surprise then how much I ended up enjoying this game and how different it is from the RPGs I’ve grown up playing. 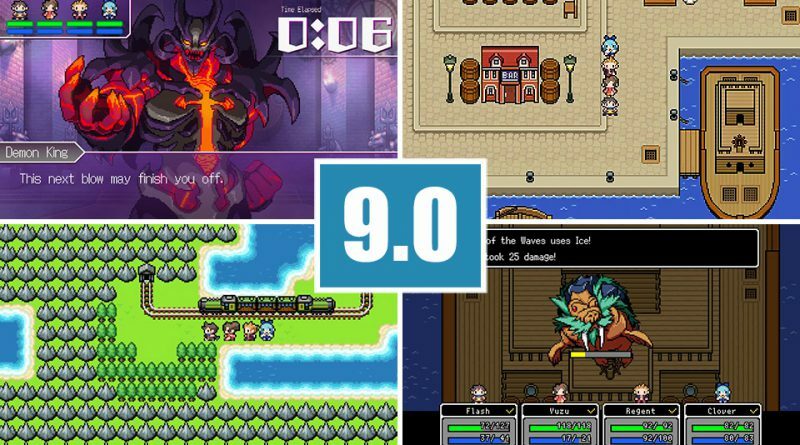 The Longest 5 minutes is an RPG that pays homage to old school RPGs while playing around with tropes of the genre. You play as 17 year old Flash Back. He wakes up confronted with the Demon King and all his memories gone. His three friends, Regent, Clover and Yuzu are with him and the team faces death unless Flash can remember how to fight. 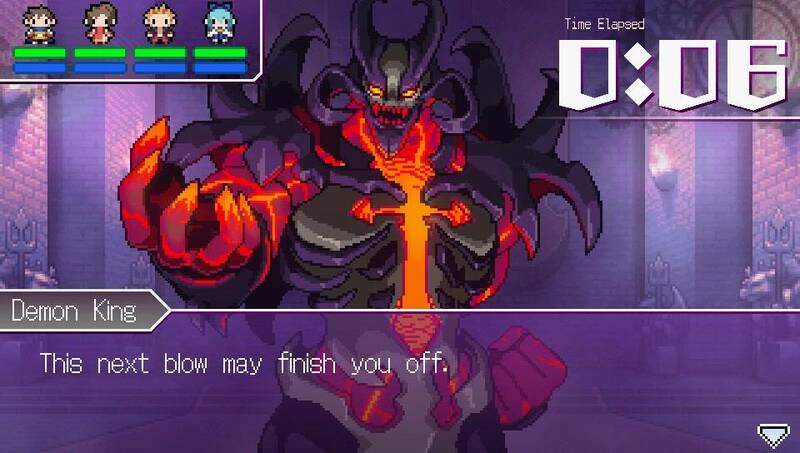 The game is spent reliving chapters in Flash’s journey to reach the Demon King while your friends buy you 5 Minutes of time to remember your past and be ready to battle the villain. The story is really well executed. Playing a 40-50 hour RPG can wear you down over time, but Longest 5 Minutes boils those 40 hour RPGs down to 10 hours of short chapters that focus just on the most important events in the journey to reach the Demon King. Those standard RPG tropes like the team becoming closer friends, a character learning their special attack or finding a legendary weapon are all there but they take place in bite size chapters. I really appreciated that the game doesn’t waste your time and let’s you focus on the key events of the story. Flash’s friends were well developed and really likeable. I enjoyed spending time with this team of characters that again ticks the boxes on the usual old school RPG set up. Flash is the knight, Regent is the black mage (although he dreams of being a bard), Yuzu is the brawler and Clover is the white mage. The characters interact so well with each other in funny and occasionally touching scenes that made me care about what happened to them. Another way the game plays with the tropes of older RPGs is the way all the characters interact with Flash. Flash is the hero and everyone knows it. He has been given the title of hero from his king and all the characters you meet along the way, including his 3 friends refer to him as the hero. It’s so different from other RPGs where you will have a main character but the rest of the party wouldn’t consider themselves less than them. Balthier in Final Fantasy 12 wouldn’t say Vaan is the only important person in the group. The parents of Flash are also very blasé about him leaving on his quest. You’d think a parent would want to protect their child from harm but nope, Flash is the hero so he has to go on his quest even if it means risking dying. I really liked the way the game played with all these expectations I have of how people interact in RPGs and how self aware it is. It also references other RPGs like Final Fantasy VII or Persona 4 with some of the scenes in the game. 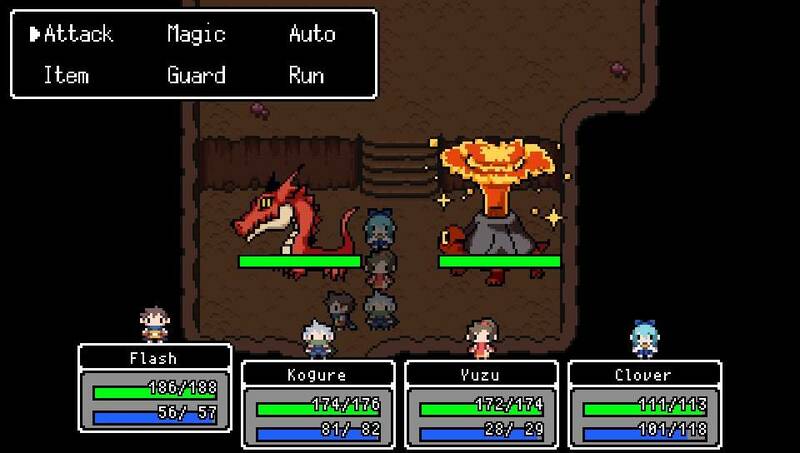 The battle system is your standard random encounter, turn based RPG. You can attack, use magic, guard or use an item. Outside of battles you will talk to people in towns, take on sub-quests, battle enemies in dungeons or explore the world map. The gameplay itself is nothing new and I found the game far too easy. Just attacking enemies with physical attacks got me through pretty much every fight. From the start of the game my team was over-powered and with random encounters happening so often, the battles did get a bit boring. You have the option to auto attack so the game automatically takes your turns. The battles only lasted a few seconds anyway and even boss battles were pretty short and easy so I was happy a lot of time to hit the auto button and let the characters kill the enemy. Between fights Clover can heal your whole party just by clicking the L trigger on the menu so I was never really at risk of dying. I mentioned already that fights were so easy because the team was overpowered, but the way the characters become stronger and gain new abilities is another example of how the game turns the usual RPG mechanics on its head. Each chapter is a memory from Flash and in Flash’s memory, each character becomes stronger as time passes to the next chapter. So one memory can be set for example where the team is level 20 and Clover has only the small heal ability. The next memory could be set when the team is level 30 and the team is stronger and Clover has the medium heal ability. Becoming stronger and acquiring new abilities can take a long time in a standard RPG and happens progressively. In The Longest Five Minutes you automatically level up and gain new abilities between chapters. Your money and items are reset between chapters. The game explains that since these are Flash’s memories he may not remember exactly how much money or items he has so it’s all just an estimate. You don’t need to worry about saving money or items and can just use them freely. That’s the same with magic points which reset between chapters. It felt quite liberating to not need to worry about saving anything. You just play each chapter how you want with no concern about saving money to buy a weapon in the far off future which is how I normally play in a long RPG. The whole game just felt very respectful of your time by not making you spend ages grinding. The focus was very much on the story and learning how Flash got to the Demon King and doesn’t need you to spend hours grinding for experience. The chapters varied in length from a couple of minutes to half an hour. The game works so well as a handheld game to play in small chunks. Some of the chapters had no fighting and were all about character development. I really enjoyed these chapters just getting to know the team. The graphics are in the style of 8-Bit RPGs and I loved it. I love pixel art graphics and The Longest Five Minutes just looks excellent. The music is also fantastic. Its tunes remind me of those old school RPGs giving that sense of going on an adventure. The battle music is particularly catchy as is the music that plays when the team enters towns. Overall, The Longest Five Minutes is an excellent game. The game is too easy but the story and characters were so charming and enjoyable that the easy gameplay didn’t matter much to me. 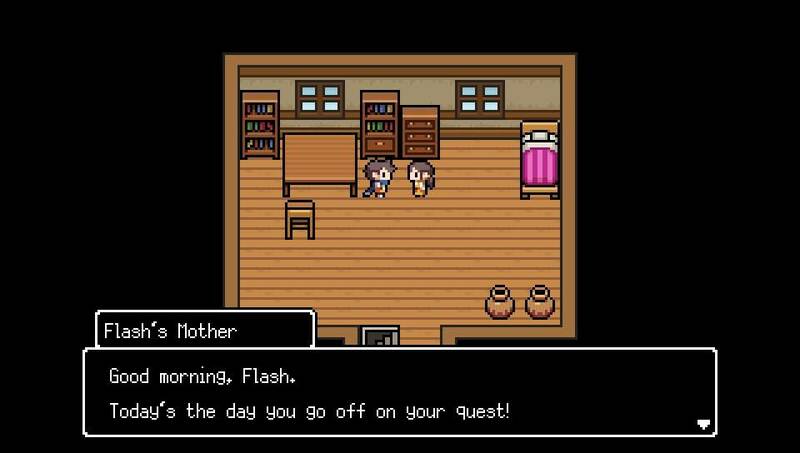 It boils the 40 hour RPG down to a much shorter experience that focuses on story and characters and doesn’t waste the player’s time with unnecessary filler or grinding. 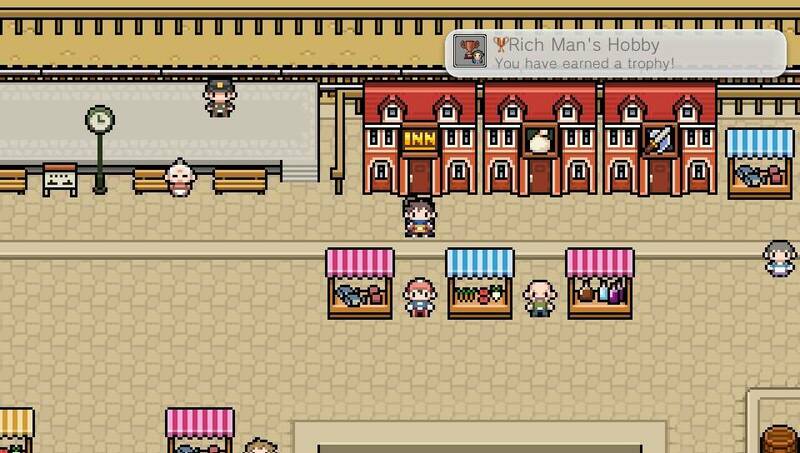 This is a game especially targeted to fans of old school RPGs who will enjoy the references to games they know and love while also seeing the common tropes of the genre turned on their head.